The iStomp™ works just like every other stompbox. Step on the footswitch to turn it on and off. Adjust the knobs to get the sound you want. The biggest difference between the iStomp and other stompboxes is you can completely change the iStomp to be any pedal in the entire pedal line. Simply connect your iPod touch®, iPhone®, or iPad® to the iStomp and select which pedal you’d like from the DigiTech® Stomp Shop™ App. In about the same time it takes to download a song you can change the iStomp from a distortion to a reverb, a phaser to a tube overdrive, or a delay to a chorus. 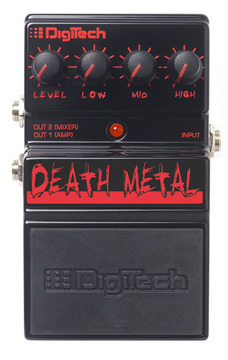 iStomp includes DigiTech’s Total Recall™ digital delay and Redline™ overdrive to get you started. lowering the delay level when you play. This is useful when playing solos in that it helps keep the delay effect from making your sound too muddy.